Queensland's latest theatre pipe organ is at the Majestic Theatre, Pomona, some 90 miles north of Brisbane. 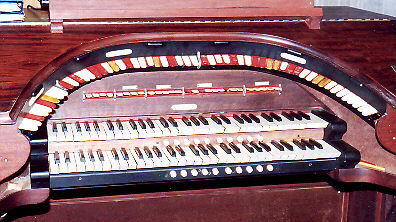 This is a composite organ, purchased from the ACT Division of TOSA. 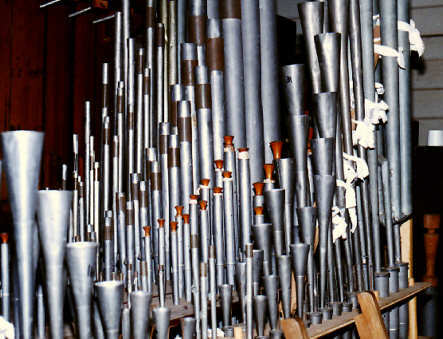 The nucleus of it was formerly in the Seventh Day Adventist Church, Concord, Sydney (three ranks of Christie pipes from the Empire Theatre, Dunedin, New Zealand), plus some percussions. 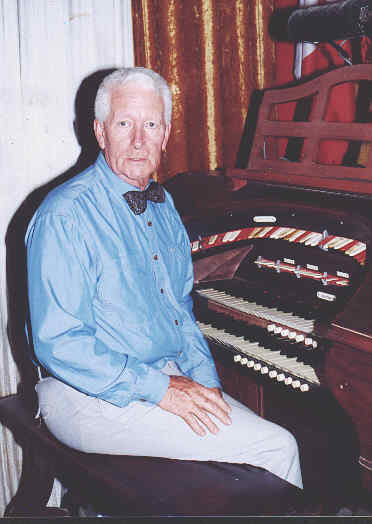 Ron West, a former Sydney theatre organist, purchased the theatre and installed the organ himself. He and Andrew Zieren play it for the accompaniment of silent films, which are the only films shown at West's Majestic Silent Film Theatre. 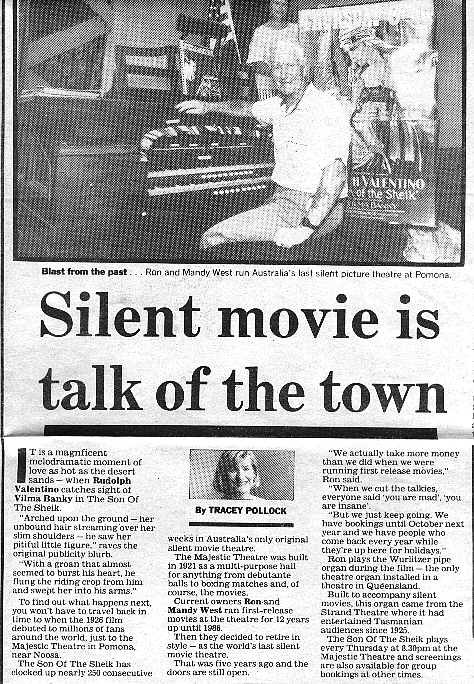 The Majestic is the only commercial theatre in Australia that shows exclusively silent films. 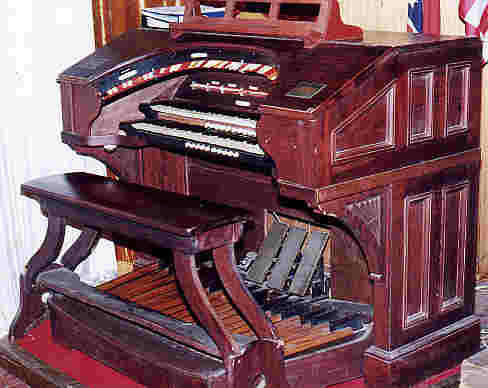 The organ is controlled from a two-manual Wurlitzer console, which was originally incorrectly believed to have come from the organ at the Strand Theatre, Hobart, Tas. 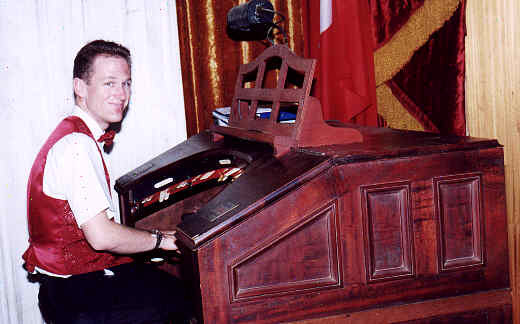 The Strand's Wurlitzer, however, had a piano-style console. 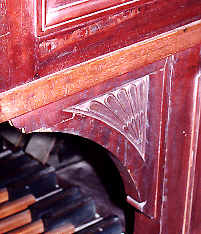 The console at Pomona is of the pre-1923 "Panel" style, with feathered brackets, and in my opinion, is most probably from the seven-rank Wurlitzer installed in the De Luxe Theatre, Melbourne, in 1922, and moved to the Paramount/Lyceum Theatre, Melbourne in 1928. 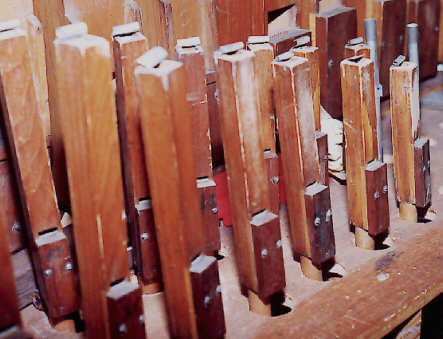 That organ was removed in 1945 and incorporated in the second organ at the Regent Theatre, Melbourne. Its console was not used there. Only the original console casing and pedalboard remain, the manuals, stopkeys and internal mechanisms having being replaced, so it is not possible positively to identify its source. 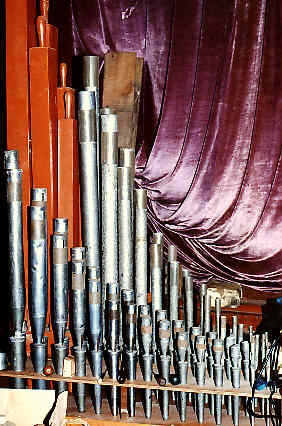 The console is located at the left-hand side of the theatre, and the single pipe chamber is on the right, speaking through shutters originally built for the unused echo chamber of the organ at the Prince Edward Theatre, Sydney. In time, there will be another chamber on the left-hand side. 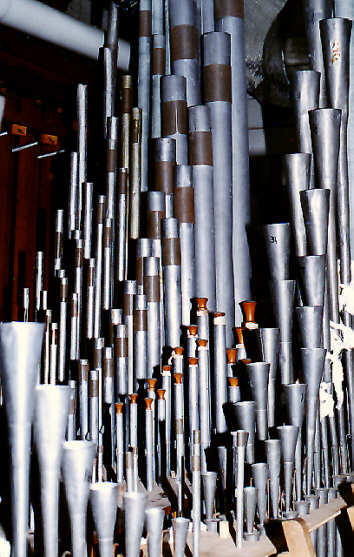 Theoriginal pipework (three ranks) comprised a Violin Diapason at 8 ft. and 4 ft., a stopped metal Tibia (the pipes of which are curiously engraved "Tuba Plena"), at 16 , 8, 4, 2 2/3, 2 and 1 3/5 ft., and Céleste at 8 ft. (Tenor C only) and 4 ft., now tuned as a normal rank. 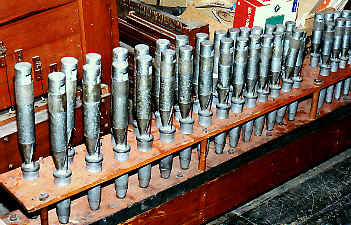 The basic pipework came from the Christie ex Empire Dunedin (New Zealand). There were 3 ranks - Violin Diapason, Tibia Plena and Viol Celeste. There was one regulator, the Vox tremulant from the Christie a set of Wurlitzer swell shades (stamped 'ECHO') and the whole lot ran on 6" wind provided by a forgeblower. (Noisy). After 20+ years the church wanted to upgrade and the organ changed hands a couple of times until it came into my posession in 1985. It was as above but had accumulated a Glockenspiel, Xylophone, Chimes and toy counter. All these were basically Wurlitzer although a lot of bits were missing from the toy counter. I started using it to accompany silent movies here in 1987 with the electronic switches which came with it. These were not successful and around 1990 I was fortunate enough to get some Compton switches. Since then the organ has been a dream to play. It is currently 7 ranks - the original 3 plus Salicional, Oboe Horn (Harrison 1892), Flute, Vox Humana (Compton). Waiting to be installed are a Compton Muted Trumpet, Kimball wood Tibia Clausa (with Compton Polyphone bass), Dulciana, Unda Maris, Gamba and Gamba Celeste. There is also a Compton Tuba. The current instrument is blown by a Discus blower (ex Anglican Cathedral, Suva, Fiji) on 6" WG. as the pipes currently in use are voiced on 6" this is not a problem. The Vox even speaks well although I suspect that the wind pressure should be higher. Ron and his theatre have become something of an institution and tourist attraction. 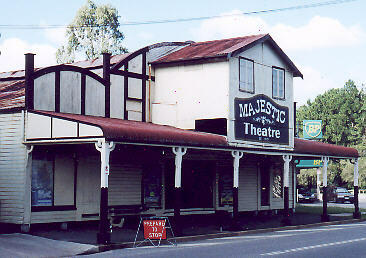 The Majestic opened in 1921 and is the oldest cinema in Australia with a continuous history of showing films. As Ron would be the first to admit, it is not the world's best concert organ. But he is not in the business of running organ concerts. 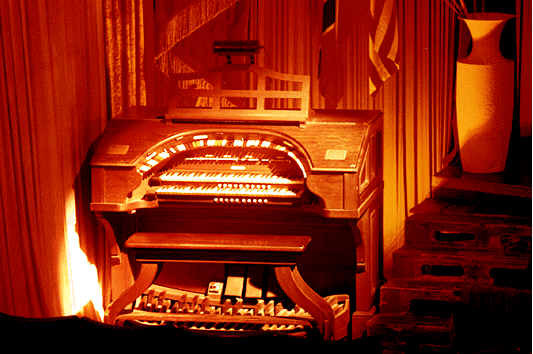 The organ is there to accompany silent films, and in that role it is very successful and its restful tones enhance the overall entertainment experience. 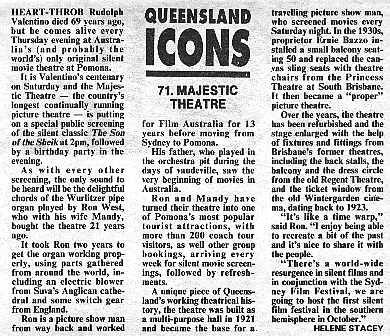 Below are some press cuttings about Ron West and his theatre.